An idyllic scene at Temple Mill Island, which used to be the home of Ed Lester's personal service company. Student Loans Company chief executive, Ed Lester, is closing down his personal service company after the furore over the revelations of his tax arrangements. A notice in today’s London Gazette reveals he and his partner Dolores Hawkins have applied to Companies House to have the firm called Placepass struck off the register. Full details of the story are on the website http://www.exaronews.com but suffice to say the company has been around for 14 years during the time Mr Lester worked for the Office for Government Commerce, NHS Direct and Motability and has had various home addresses from Cambridge to London Docklands. The firm was used as a ” tax efficient” way for the chief executive to funnel his £182,000 pay and pension package and his £28,000 in expenses from the Student Loans Company. 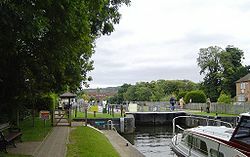 It was based at his home on Temple Mills island on the River Thames at Marlow, Buckinghamshire. The island is a gated community. Ed Lester’s decision is interesting . The story of his tax arrangements is already causing alarm among thousands of other people working for government departments, agencies ,the NHS and local government. The chancellor, George Osborne, is also looking at changing the tax laws covering this in tomorrow’s budget. It will be complicated and people need to watch for the small print in the Budget statement to find out what will happen. This entry was posted in Uncategorized, Whitehall and tagged budget, Ed Lester, students, tax avoidance. Bookmark the permalink.